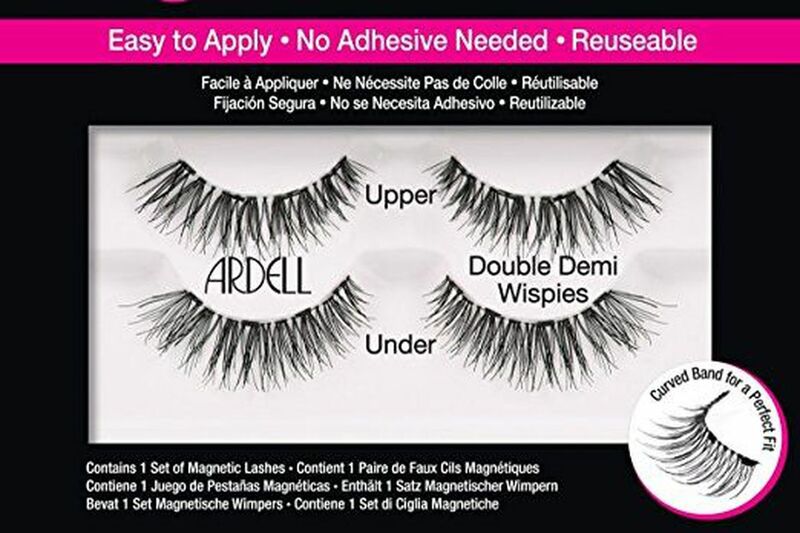 A pair of Ardell Magnetic Lashes. The problem is that I didn't listen to the beauty gurus. The beauty gurus — those women (and men!) on YouTube and Instagram who try seemingly every makeup and skincare product on the market and then offer their opinions — almost never agree. This is, of course, because people have different skin and different needs and different opinions about what looks good. But even if you've found a series of soul mate beauty gurus who have identical coloring and skincare needs to yours, they still won't agree with each other or with you. So when all of the beauty gurus resoundingly agreed that a new product was terrible? I should have listened. I should not have bought said product. And I absolutely, positively should not have tried to use it for the first time right as I was heading out for a big night. Let me save you from the same ill fate. No matter how awesome they sound (and they sound so awesome! ), those new magnetic false eyelashes are absolute junk. First, some background. My natural eyelashes aren't exactly showstopping. They're not terribly long, and it takes a tremendous amount of product and coaxing to stop them from hanging straight down over my eyes. So when I'm heading out and want to put in a little extra effort, I wear false eyelashes. I've worn them enough that I can apply them quickly and accurately, but there's a pretty steep learning curve in the beginning. It often takes about 10 times as long to apply them as you think it should. If you place them wrong, the glue will destroy your eye shadow, sometimes to the point where you have to wipe off your eye makeup and start again. Also, many people are freaked out by the idea of applying glue to their eyes. The reason I was so eager to abandon traditional false eyelashes is simply because they don't last very long. The act of coating something in glue and mascara — and then ripping it off a few hours later — just isn't good for overall structural integrity. I can usually get only a few wearings out of a pair of falsies before they're headed for the trash. So when I saw the Ardell Magnetic Lashes ($13.99 on Amazon), I couldn't add them to my cart fast enough. The idea is this: Instead of one false eyelash on each eye, you wear two that sandwich your natural lashes, held in place by tiny, powerful magnets. No glue! In practice, they were comically, comically bad. Normal false lashes are glued to your eyelid. But no matter how hard I tried, I just couldn't get the magnetic lashes to stay close to my skin. They floated out, sometimes whole centimeters from my lid, so there would be a stretch of my actual lashes and then suddenly lots and lots and lots of fake eyelashes, because it's actually double the amount of fake lash a person would typically wear. The problem is that, rather than an even strip of glue, there are only a few magnets on each lash. There is, in my semiprofessional, non-beauty-guru opinion, absolutely no way to apply these and not have them look ridiculous. Ridiculously bad, ridiculously fake; take your pick. Plus, if putting glue on your eyelid bothers you, you'll really love putting powerful magnets under your eyelashes right next to your eyeball. Yes, you will poke yourself in the eye at some point in the process. Alison Smith will listen to the beauty gurus next time. Got a burning beauty question? Email asmith@philly.com.